What is Metadata on MS Word? It is a hidden information on document which contains info such as revision logs, author, comments, keyword, hyperlinks, and a lot more. These data can be private and should not be shared along with your Word document. 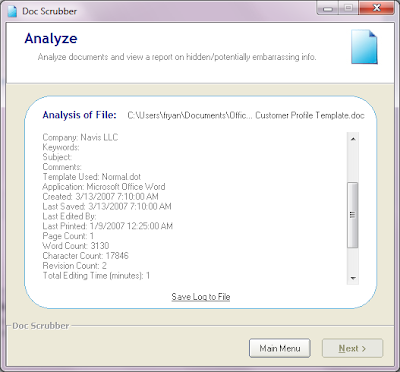 If you want to remove your private information on a document before sharing it then you can use a free program called Doc Scrubber. 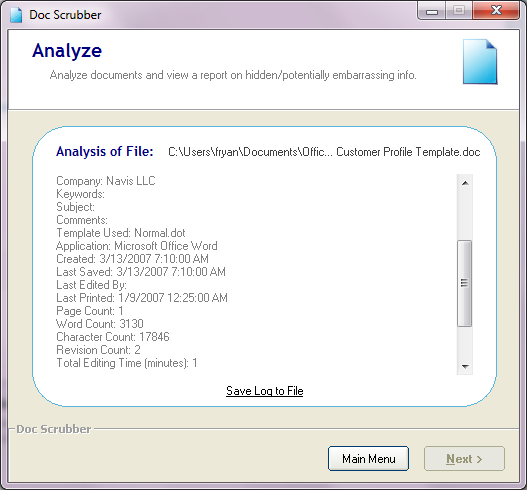 Just download, install and run Doc Scrubber. Click the Analyze button to see what metadata can be seen on your document. On the next step, the app will ask for the document you want to analyze, just locate the file and the document's metadata will be displayed. Now to clean the hidden data from the Word document, just hit the Scrub button. You can also choose from the available scrubbing method before proceeding to the cleaning process.